Petroleum Services are leaders in the oil industry. Over 20 years experience in the industry has allowed the company to thrive. Our experience is passed on to you through top quality products, impeccable service, and the highest standards to meet all industry regulations. The company has been providing products and services to the Oil Industry since 1992. We pride ourselves on providing quality products and services in the aim to add value to all customers we serve. Many of our trade qualified staff have worked in the industry for over 20 years and have accrued a broad range of skills including electrical, mechanical, engineering and fabrication. We have both the experience and skill set to provide trust worthy service without fail. Thanks to our loyal customers and quality staff the company has grown over the years and now operates in three divisions. Petroleum Services – Continuing to offer specialist services to the oil industry, our service department offers a range of technical ability. From Service Station servicing and calibration, to entire Service Station design, build, Project Management and more. 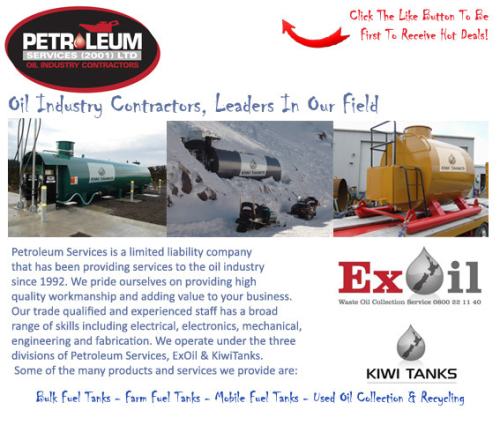 Kiwi Tanks – Are responsible for the design, manufacture, installation and programming of fuel storage solutions for every use from the farm to commercial trucking solutions. Our range caters for all sizes and uses from 200L diesel/petrol Ute Tray Tanks to 100,000L above or below ground Truck Stop or Service Station fuel storage solutions. Ex Oil – is our fully accredited waste minimisation used lubrication oil collection service. It is our aim to operate a sustainable enterprise and leave the world as we found it. As a scheme manager of ROSENZ (recycle oil and save the environment of NZ) Ex Oil endeavours to offer the best oil recovery operation available.